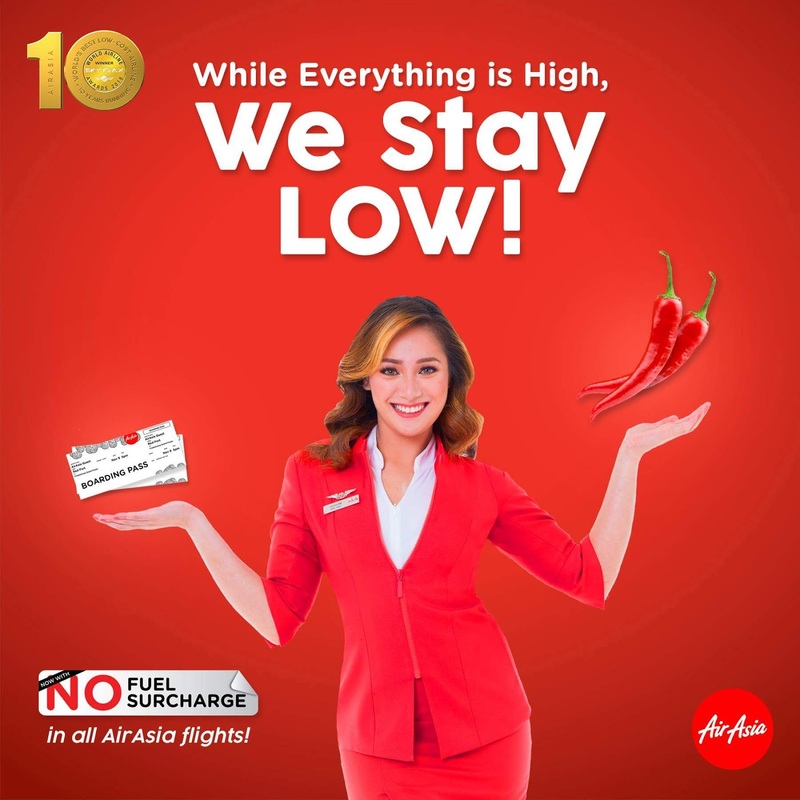 MANILA, 2 OCTOBER 2018 – AirAsia, the World’s Best Low Cost Airline, announced today it will not add fuel surcharge on domestic or international fares, staying true to its commitment to provide unparalleled low fares. Last September, the Civil Aeronautics Board (CAB) approved the guidelines on the imposition of the passenger fuel surcharge for domestic and international flights. The CAB also adopted a matrix for fuel surcharge that will be determined based on the two-month average of jet fuel MOPS (Mean of Platts Singapore) prices in its peso per liter equivalent and will be fixed for two months. Based on the published and approved matrix, fuel surcharge rates for domestic flights are divided into five categories, depending on flight distance. Domestic airfares according to CAB estimate could be slapped with an additional cost of up to P769 and those for international flights by as much as P9,860 with the reimposition by local carriers of the fuel surcharge. “We are closely monitoring the impact of high oil price on our operations, however, we are also working hard to offset the sharp jet fuel costs by adopting cost-efficient measures across the network or within the AirAsia Group,” Comendador said. AirAsia is set to launch new flights to and from Cagayan de Oro and Kaoshiung in Taiwan on 28 October. Promo fares from as low as P850 are available for booking now until 7 October 2018 at www.airasia.com and valid for travel starting 28 October 2018 to 30 March 2019. AirAsia currently operates a fleet of 20 aircraft with flights to and from Manila, Cebu, Clark, Davao, Tacloban, Puerto Princesa, Iloilo, Tagbilaran and Kalibo/Boracay including international flights to Kuala Lumpur, Kota Kinabalu, Hong Kong, Macau, Shanghai, Shenzhen, Guangzhou, Ho Chi Minh, Bali, Taipei, Singapore, Seoul/Incheon and Bangkok.